shedding of hair on a German Shepherd Puppy!! 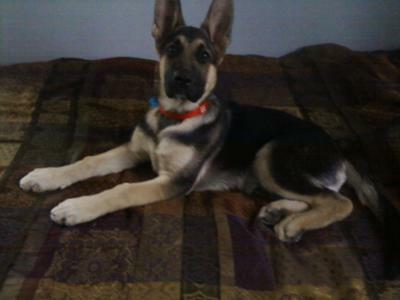 My 8mth german shepherd sheds so muchhh!! does the shedding ever stop or clam down because my mom wants to give him away because she hates that he sheds everywhere!! but hes my boy! i cant ever give him away!!helppp!!! German Shepherds shed! That's just the way that it is - sorry. And some shed more than others. And some times of the year they may shed a whole lot in just a few weeks. But with that said there are many things you can do to help cut down on the amount of shedding that your German Shepherd does. For example, here are two ideas for you, the first and best thing that I would suggest would be that you take your German Shepherd outdoors and groom him several times each week. Brush his fur all over his whole body some days and then some days focus on any problem areas. This will definitely help cut down on a lot of hair that would be otherwise shed in your house (because you brushed it off out doors)! Next, take responsibility for the care of your GSD indoors and help your mom by sweeping or vacuuming up all the loose fur that you see. That will cut some stress down off her and help you to be able to keep your boy that you love so much! These 2 tips alone should help you greatly in relieving a lot of the shed fur flying around in your own home. And if you want to read even more about grooming your German Shepherd, then please check out this page. Good luck with your German Shepherd puppy!